We were delighted to welcome nearly 300 people to the annual kogo launch on Sunday 17th March. People came from near and far - it was great to see so many familiar faces as well as having the opportunity to meet other kogo volunteers for the first time. We were overwhelmed by the wonderful donations which so many of you brought along on the day. 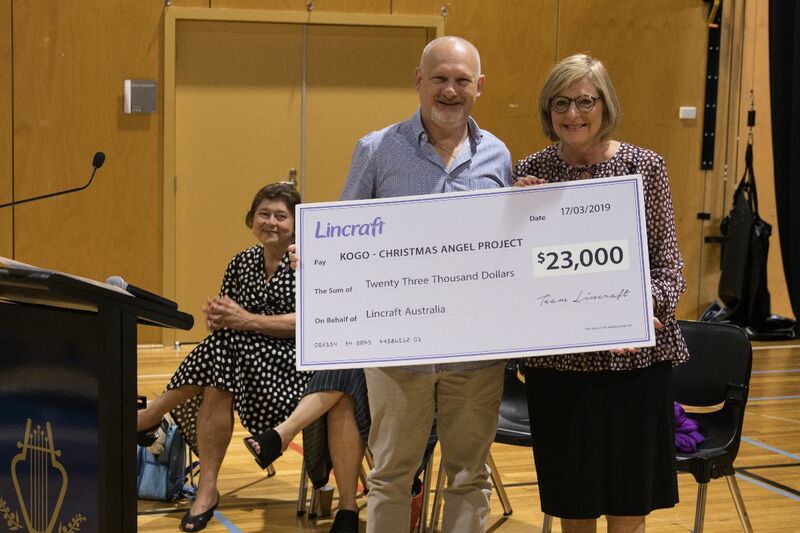 For 6 weeks before Christmas last year, our wonderful supporters Lincraft asked their customers for a gold coin donation towards the kogo Christmas Angel Project. This resulted in raising a total of $23,000. We were very pleased that Brian Swerski joint managing director of Lincraft presented kogo with this magnificent donation at our launch. These funds will go directly to purchase gifts for our 2019 Christmas Angel Project. Once again, we were privileged to hear from two speakers representing community partner organisations that benefit from your donations. Our first speaker was Di Morton who is Team Leader at Housing Support Services at Launch Housing East St Kilda which provides 6 weeks crisis accommodation for single women over the age of 18. Di gave us a very informative talk about the terrible situation of homelessness faced by women of all ages. As Di herself is a knitter, she was able to appreciate all the hard work and love that goes into the items that kogo donates to Launch Housing – in particular the blankets. She explained the joy (even if it is momentary) that the presentation of these blankets gives to their clients who come to the crisis accommodation more often than not with absolutely nothing. 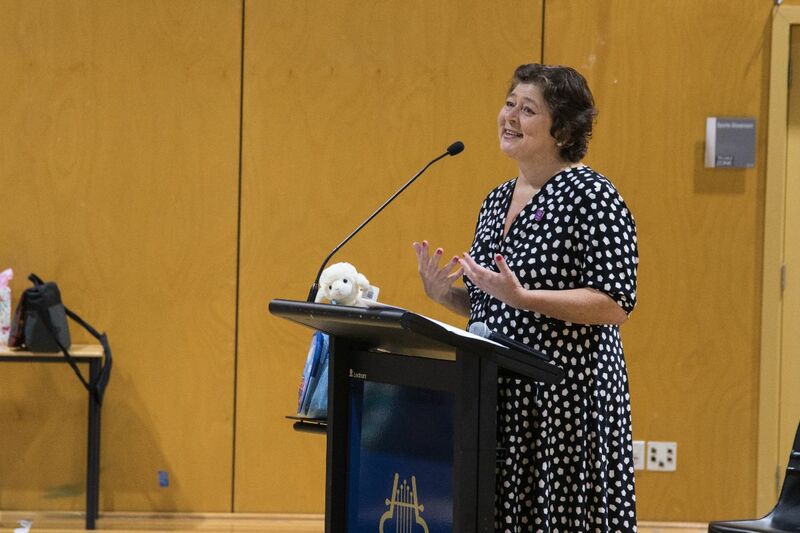 Our second speaker was Lesley Podesta who is the CEO of the Alannah & Madeline Foundation. 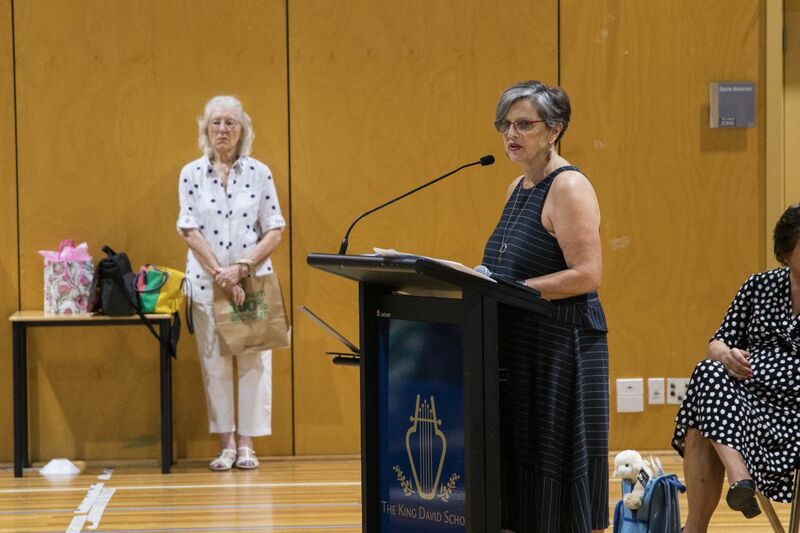 Lesley commenced her speech by talking about the recent tragic events that happened in Christchurch and relating them to the Port Arthur Massacre which lead to the establishment of the Alannah & Madeline Foundation – an organisation dedicated to keeping children safe. The Alannah & Madeline Foundation never spend time talking about the perpetrators of such acts of horror (because this is what they are seeking) and concentrate instead on the victims and how to protect them. However, Lesley did point out that very often these perpetrators were victims of bullying themselves. This is one of the many reasons that the Alannah & Madeline Foundation are happy to partner with kogo in the anti-bullying awareness project Beanies Not Meanies. We are pleased to announce that we raised $2,400 from our yarn sale. We would like to thank the King David School for once again allowing us to use their wonderful school hall and also David Opat for overseeing the morning. A special thank you goes to Jed Hawkins from Eden Espresso for donating all the catering for this event. kogo is very proud to be partnering with the Alannah & Madeline Foundation and Lincraft Stores to run an anti-bullying awareness project in 2019. 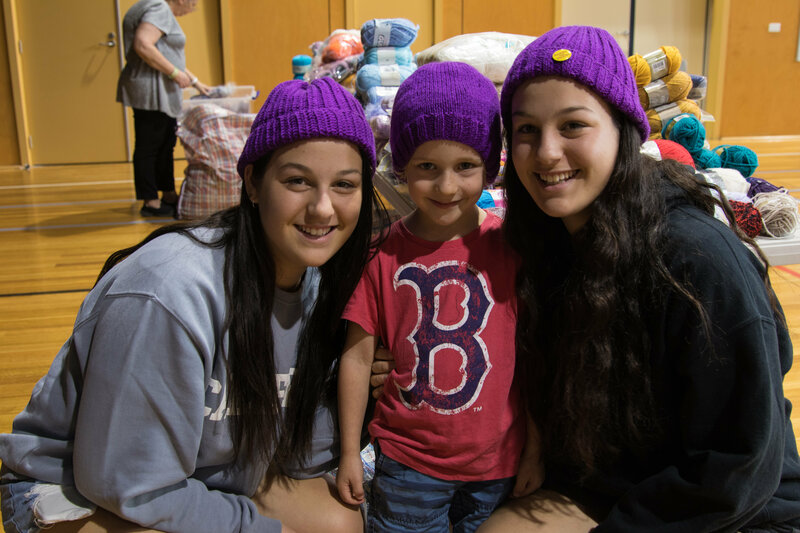 For this worthwhile project, we are asking our volunteers to knit or crochet a purple beanie in sizes suitable for primary school aged children and adults. We have chosen purple as it is the colour used by Alannah & Madeline Foundation and because we want to make an impact by standing out in the crowd to help stamp out bullying. Please send your finished beanies to kogo in the usual way by Friday 31st May. The Alannah & Madeline Foundation will put the beanies into their Buddy Bags (these are backpacks filled with basic essential items for thousands of children going into emergency accommodation) in the lead up to winter. We are working with the Alannah & Madeline Foundation on a very exciting event to spread the anti-bullying message nationally! Stay posted….. Please support the project by visiting any Lincraft Stores and purchasing the specially-dyed purple yarn. Small "Beanies not Meanies" badges will also be on sale in store to attach to your beanie if you want. All proceeds from the sale of the badges will go to Alannah & Madeline Foundation. Of course, you are very welcome to use your own favourite pattern or yarn as long as it is purple! We want to spread this initiative as far and as wide as possible, so if you would like a Beanies not Meanies poster for your school, workplace, doctor’s surgery, favourite café or anywhere else, please email Di to admin@kogo.org.au or phone and leave a message on 0409 438 603. We are very pleased to have formed a partnership with Eat Up Australia. Eat Up is a not-for-profit organisation that was founded in 2013 to help feed hungry disadvantaged school children. They provide sandwiches made by various support groups within the community and at corporate level to assist children who come to school without lunch. The sandwiches are delivered on a fortnightly basis and stored in the school's freezer. The Eat Up drivers will also deliver a bag of kogo beanies to all the participating schools. After many years of dedication, Joy Manners is retiring from the role of co-ordinating the blanket team. We thank Joy and her team for their tireless work over the years. We welcome Bella Becher to this role. Bella together with Marian Evans and Margot Froude spend Tuesday mornings sorting all the knitted or crocheted squares and/or strips that you send in to kogo and put them into kits ready to be distributed for sewing or crocheting together to make blankets. We love receiving all the items that you send to us but sometimes we seem to have a lot more of one thing and less of another! At the moment we have lots of premmie clothing, babies’ beanies and booties but we need more babies’ jackets. We will keep you updated as our needs change. We are always happy to accept balls of yarn if they are WHOLE balls – not bits and pieces but we don’t need either patterns or needles. Please check our website http://www.kogo.org.au/locationmap regularly regarding drop off points because there are constant changes. We now have a more user-friendly system for finding your nearest drop off point. For those of you who receive the newsletter by post, would you please let us know if you (or someone that you know) have an email address and if so, would you be happy to receive the newsletter by email. This will help to reduce our postage costs.